Tim Holtz Glass Media Mat by Tonic Studios. 14x23 inch with a 12x14 inch measuring grid area, 7.5x11 inch mixing palette area and 7.5x11 inch removable non-stick mat with heat resistant surface. CAUTION: This product is made from tempered glass and is to be used as a cutting surface only. Do not drop or hammer directly onto the glass surface. The 'Media tool Set' is also available to use with this mat. 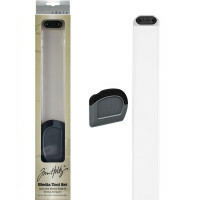 This little tool has 7 sharp recessed blades to create altered and aged edges on paper and cardstock..
Tim Holtz's Idea-Ology Sanding Grip Refills. 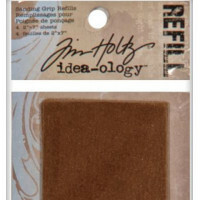 This package contains four 2x7in refill sheets for ..
Tim Holtz Media Tool Set par Tonic Studios. 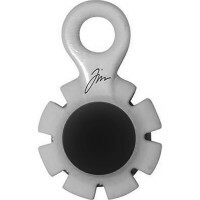 Designed for use with the Tim Holtz Glass Media Mat sold..